We all know very well that the tech giant Microsoft’s strategy has changed radically over the past two years. In addition to fully entering the hardware market, in particular with the 2 in 1 Surface and the new Laptop Surface Laptop, it seems to have new plans for its operating system as well. Hence, recently, it announced a new version of Windows 10. Windows 10 S was announced last May at #MicrosoftEDU. The main focus of the tech giant Microsoft when launching this new version of Windows 10 was to create a version aimed at students and teaching, with superior optimization and lightness, to add more performance and autonomy on the hardware of the device. This week at the Microsoft Ignite conference in Orlando, the tech giant Microsoft introduced a new version of Windows 10 S, this time aimed at the corporate and business market. This version is called “Windows 10 Enterprise in S Mode” and, as the name implies, derives from the Enterprise version of Windows 10. As with the release of Windows 10 S, whose core comes from Windows 10 Pro, this “Windows 10 Enterprise in S Mode” will receive the core of Windows 10 Enterprise, so it is expected that this new version of Windows 10 will have some features unique to the Enterprise, such as AppLocker, App-V, UE-V and Device Guard. 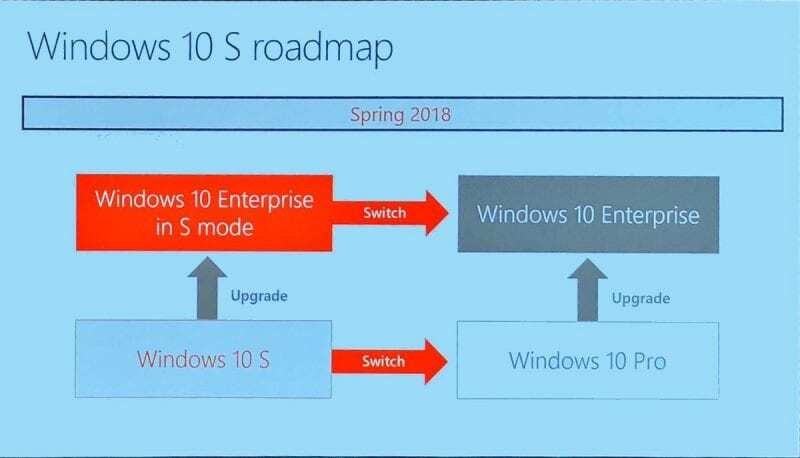 In addition to the features shared with the Enterprise version, the tech giant Microsoft allows you to upgrade from “Windows 10 Enterprise in S Mode” to Windows 10 Enterprise for free and quite simply, in the image of what happened in May with Windows 10 S, in which Microsoft offered to upgrade to Windows 10 Pro by the end of the year, although it later extended the time limit. Microsoft says that this new version of Windows 10 is aimed at companies and therefore has put all the attributes of the Enterprise version to which are added the advantages and idiosyncrasies of Windows 10 S, among which is the impediment of running applications and software from other sources, in addition to the Windows Store, greater autonomy and overall device performance. The “Windows 10 Enterprise in S Mode” will be released sometime in the spring of 2018, but it is not yet known what equipment will have installed this version of Windows and the actual launch date. The tech giant Microsoft is sure to release more information about it in the coming months. In the same event where this new version of Windows was presented, new equipment with Windows 10 S of several OEMs, including Lenovo, HP, Acer, and Fujitsu, will be launched in the coming months, at very high prices.